A social wall unites content from visitors, exhibitors, speakers, sponsors and the media, and it even allows those who’ve stayed home to interact with the people on site. A Q&A session where the speaker lets the listeners easily tweet in their questions. These are then displayed on the big screen on stage, so speakers and all guests can see them. An informative and engaging live stream with content that is generated by the audience during the speech. This is the classic twitter wall. Organizers can enable exhibitors to reach visitors via a big screen on the fairgrounds. That way they can be informed about current news, such as show’s starting times or special attractions at the stands. A social wall keeps the fans entertained in between acts. No one can resist the urge to see their own face on the big screen of a stage where the image of their favorite star is usually displayed. What motivates athletes more than the support of their fans? A social screen in the stadium brings their motivational messages directly to the stars. And what’s more, it connects content from the fans, current information about the event, personal messages from the athletes and content from sponsors. This forms an interactive entertainment program—before, after and during the event. No need for photo booths or disposable cameras at weddings—a hashtag is all you need. Give the guests a few props, a designated photo corner and stream it all to the screen. A social wall will put partygoers in a good mood for sure, and they’ll have lasting souvenirs. The Viadukt is an urban shopping street in Zurich. It can be found under the 36 arches, which were originally constructed in 1984 as part of a railway viaduct. 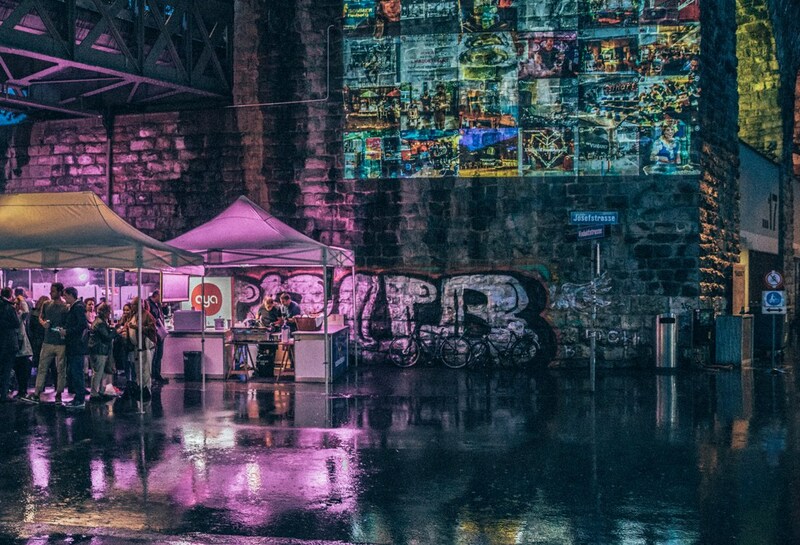 As they do each year, the restaurants, shops, studios and galleries invited the public to the grand #viaduktnacht (“the night of the Viadukt”). One of the highlights was the social wall unlimited: visitors could project their snapshots onto the façade of the viaduct in life size, and with a bit of luck they could win shopping vouchers.